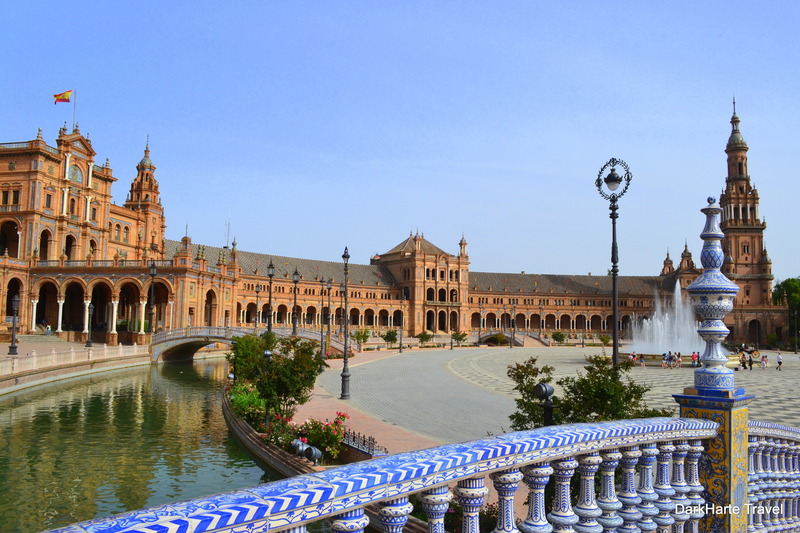 Seville was stop one on my tour of Andalucia, the southernmost region of Spain. We flew from Stansted, over the Pyrenees mountains, laced with snow. Further south the land became brown and dry, despite the presence of rivers and large lakes. 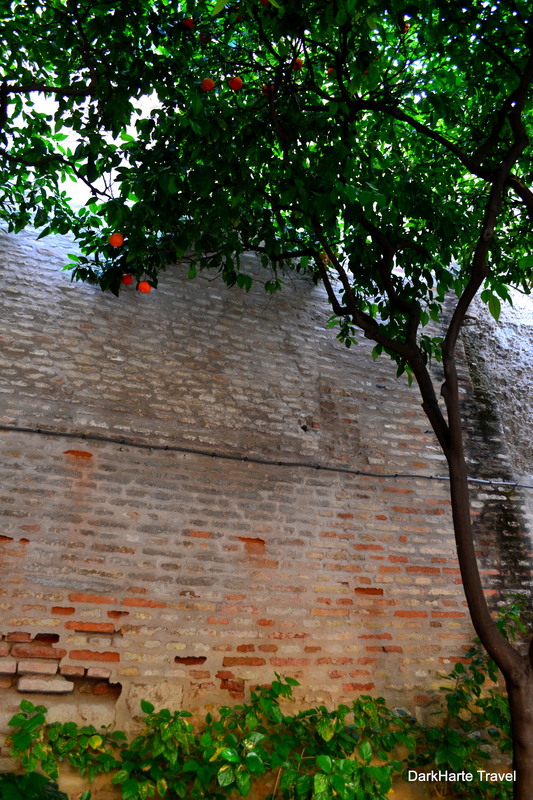 There were fields and fields of orange trees, planted in orderly rows. Near Seville airport we descended above houses – every one of which had a swimming pool. 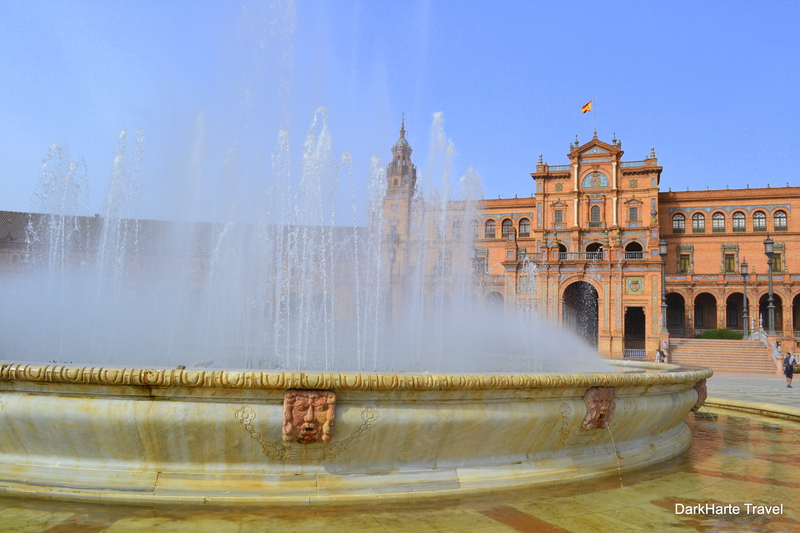 Seville was pulsing with heat, a rich thick heat that enveloped us as soon as we stepped off the plane. We took a bus from the airport and got off at Place de la Delicias, near the Torre del Oro (the Golden Tower) and the wide blue river, part of the Rio Guadalquivir. It took about two and a half hours to navigate from here through the winding alleys of the old city to find our pensiõn, partly because the Rough Guide map pointed south-east rather than north for some reason, making it difficult to combine with information from other maps, but largely because of the lack of road signs or names on streets and bridges – which was to become a feature of our trip to Spain. 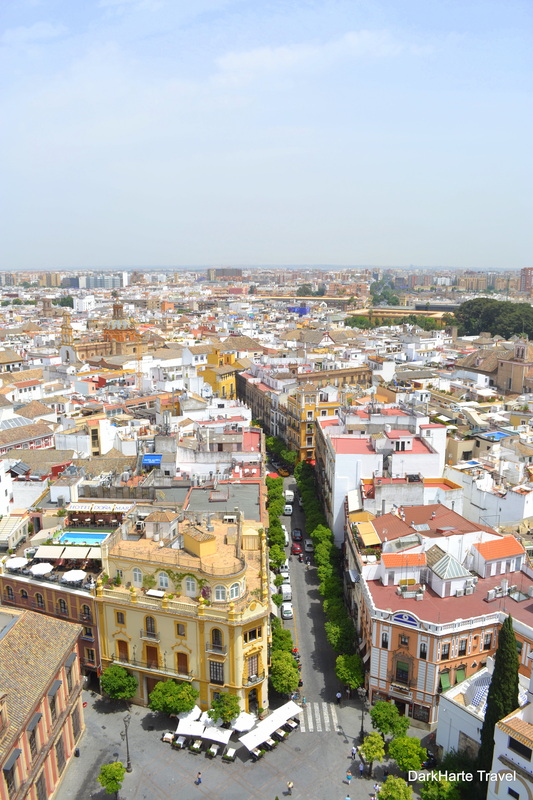 We stayed at a pensiõn in the heart of Seville’s delightful old city, a maze of streets branching off from the stone walls of the Alcazar, streets that are medieval in their narrowness. After a shower we went out for dinner at a tapas bar. It was a local rather than tourist bar, a dark, authentic place with sticky tables, and where most customers stand at the counter to be served their dishes. We had beer (a really nice Pilsen), agua minerale, croquettas with alioli (garlic mayonnaise), albõndigas (meatballs), chicharrones (fried pork rind), bread, alitas de pollo (fried chicken wings), and pisto manchego (a tomato-onion-courgette dish). I ordered in Spanish! The plates were €2 each, making €16,80 for everything – a dinner for two for £12.30. 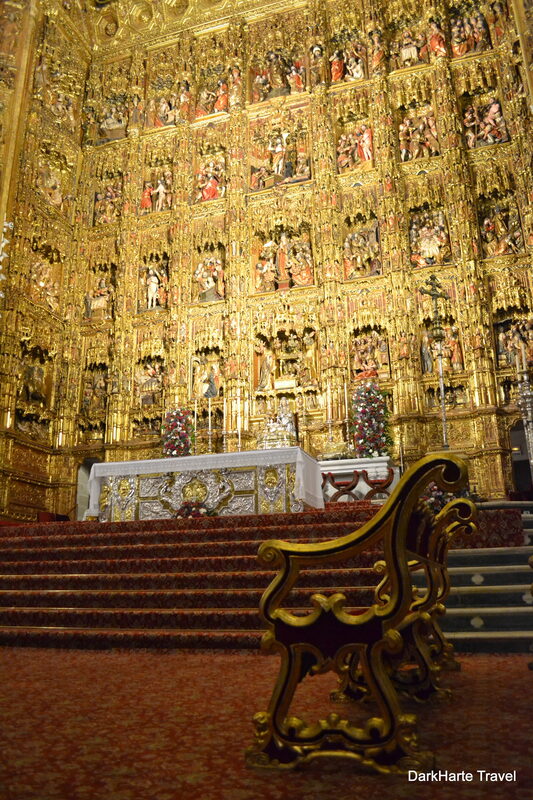 After dinner we wandered by the Alcazar and cathedral. It was still very warm and there was a nice breeze. There were several horses harnessed to carriages standing around in the plaza as the sun was setting behind the catedral. Music emanated from the cathedral, haunting the hot dusk. The sky was full of swallows calling and chasing around, catching the evening insects in ceaseless motion like the waves of the sea. 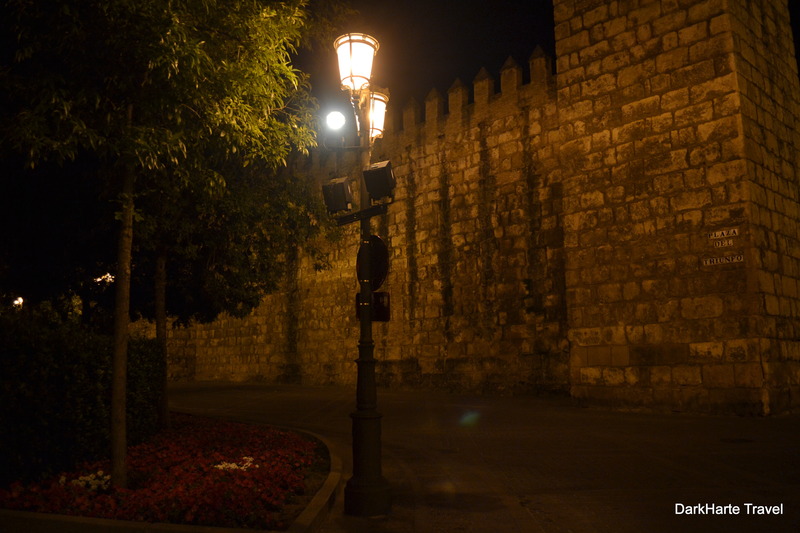 We sat in a courtyard next to the old stone walls of the Alcazar, surrounded by dark green foliage and soft lantern light. Palm trees with thick, tall trunks grow everywhere. 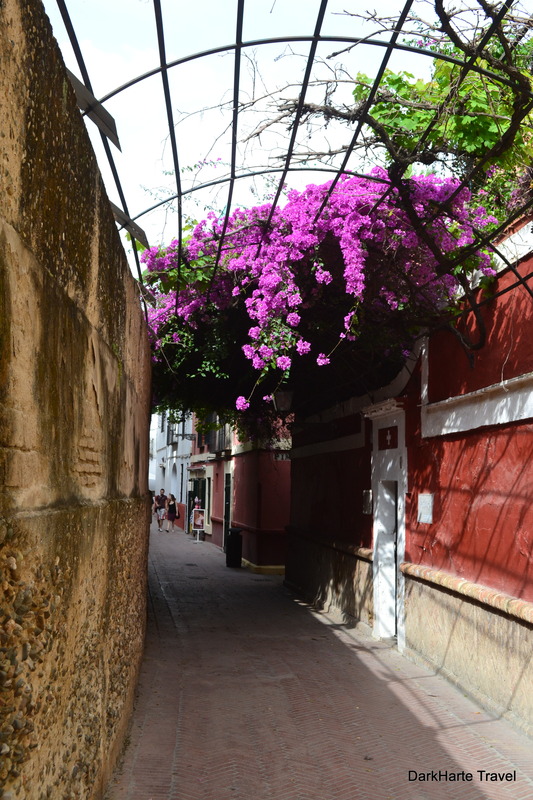 There is a small pink flower that has opened for the night, in a garden between the Alcazar and the catedral, and moths flock to it. 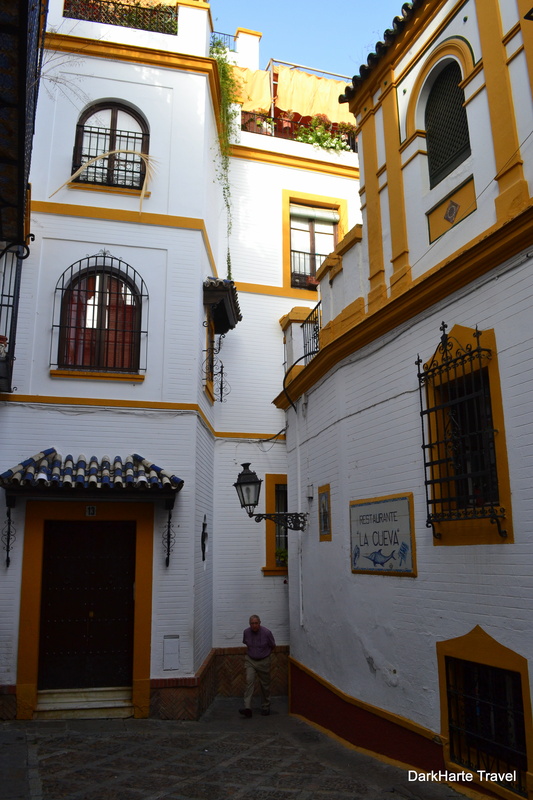 The next morning we wandered through the old city, a labyrinth of interesting alleyways, past panaderías (bakeries), spice shops, restaurants that open into basements, and pensiõns with colourful ceramic tiles lining their entrance halls. The mortar between bricks is crumbling away, and in places has turned to sand. 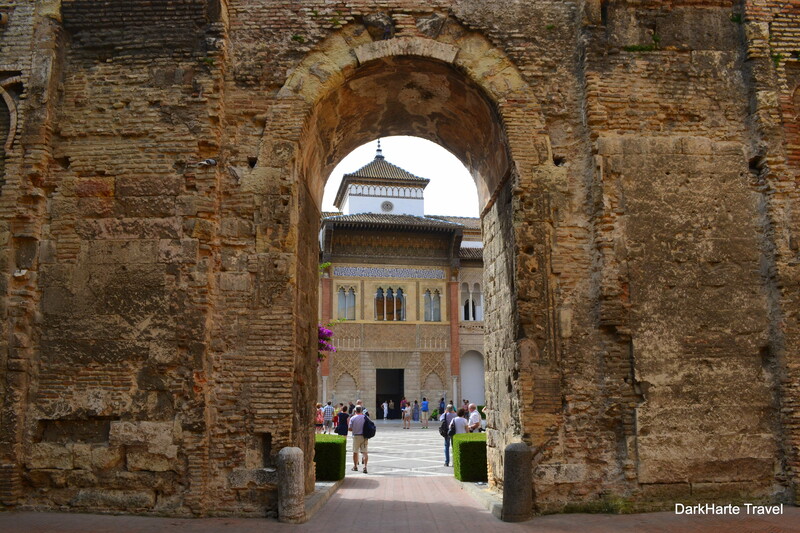 We visited the Alcazar, which is a Moorish palace. 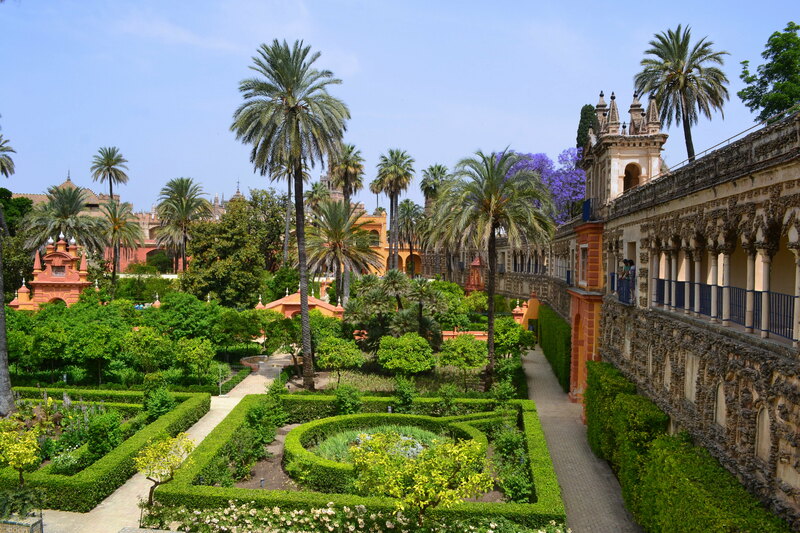 Its thick defensive outer walls shelter an opulent Islamic interior and amazing gardens with tall palm trees, fountains, terraces, and huge canopies of pink bougainvillea. 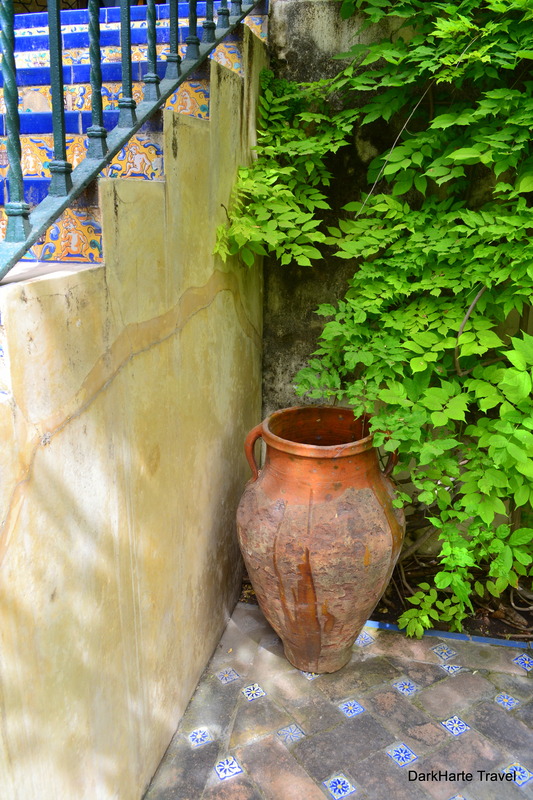 We enjoyed sitting in this little alcove with tiled seats. There is an underground level with a vaulted ceiling and a reflective pool. 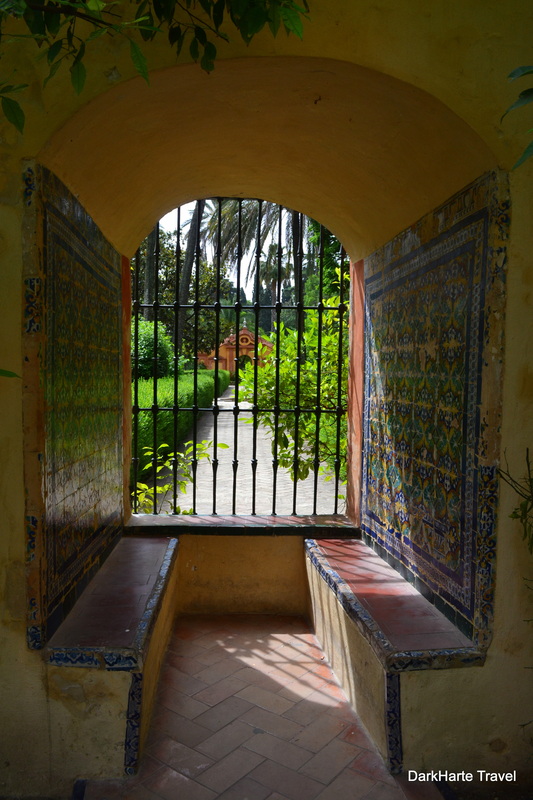 On leaving the Alcazar we had ice cream for lunch; the flavours I chose were dulce de leche and mint with chocolate. 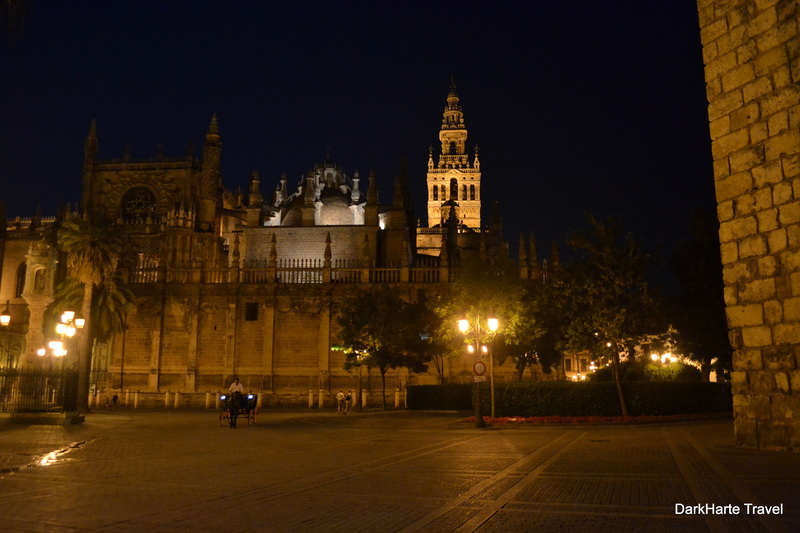 We went to Seville’s cathedral. It is impressive from the outside, dominating the central plaza, but I didn’t like it on the inside. It was dark, ornate and heavy – not at all the light, bright, uplifting feeling I associate with spirituality. 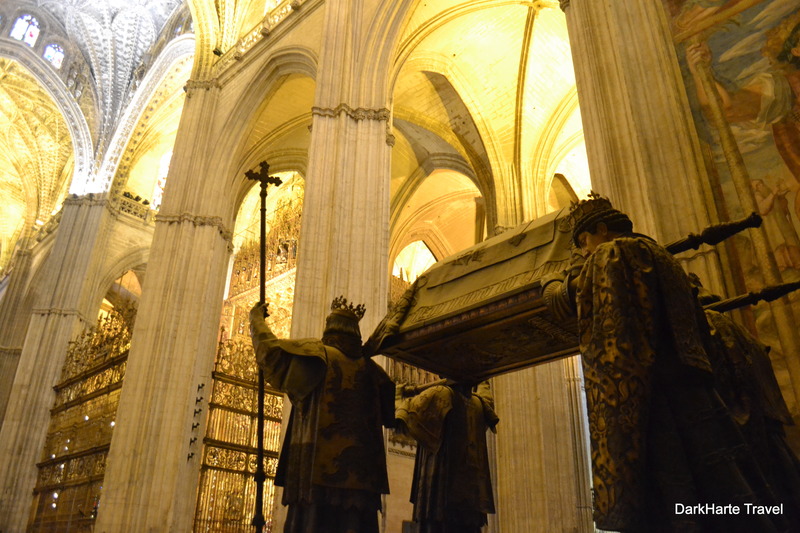 It left me with the sense that throwing copious amounts of gold and marble at something does not make it beautiful. 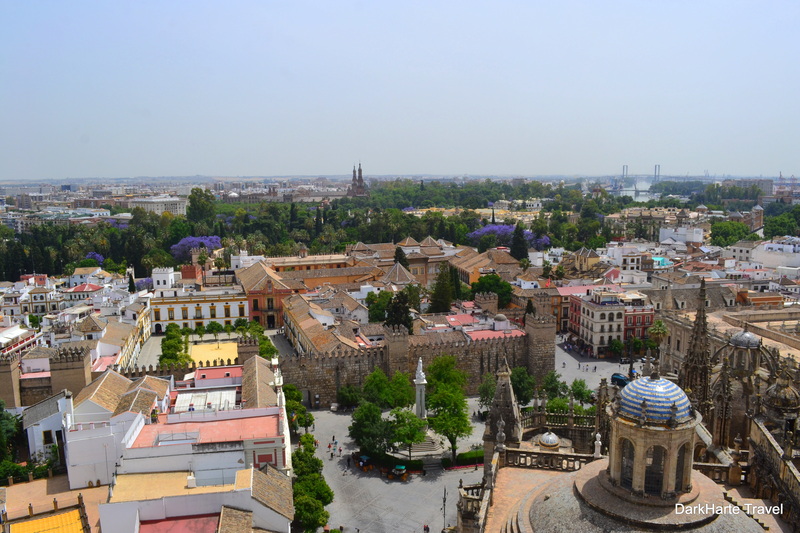 We climbed up the Giralda tower for a view over Seville. 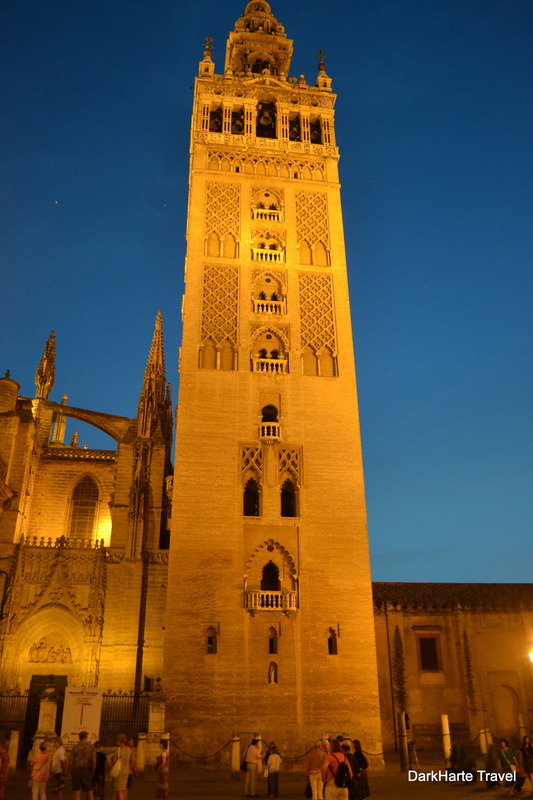 The Giralda is an older, Moorish construction, attached to the later catedral. 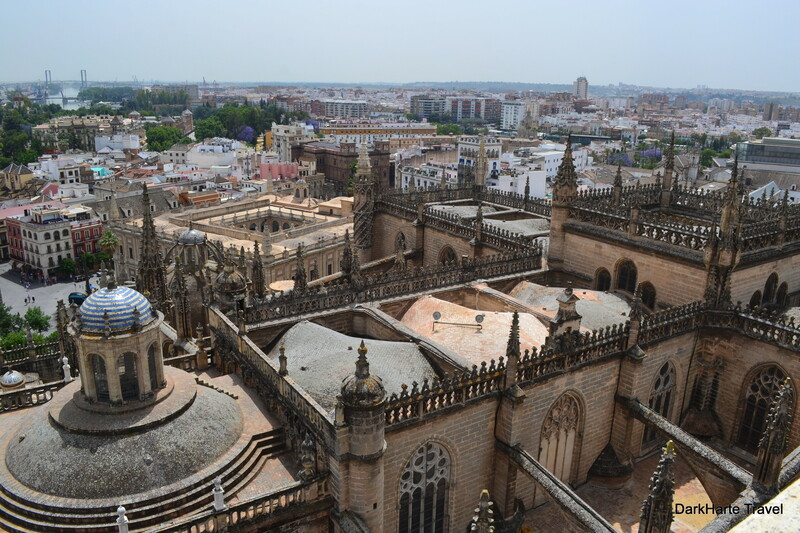 Climbing to its top we could see the cathedral from above, and the alcazar with its gardens, as well as a panorama over the city to its fringes in the green hills. 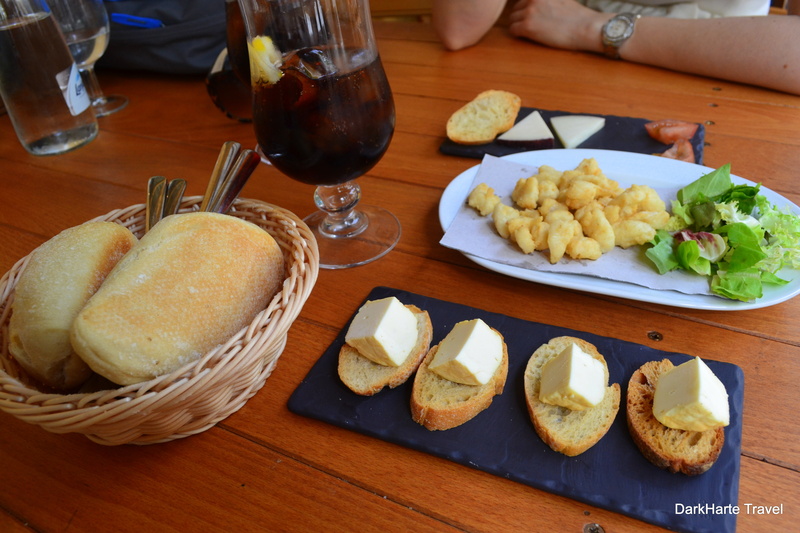 Then on to snacks at a tapas bar near the catedral, followed by a long hot walk to the Plaza de España. 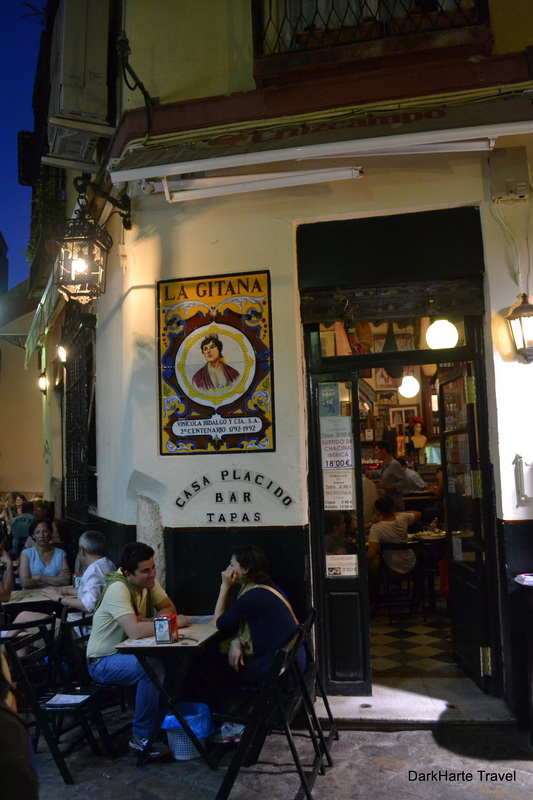 This last was absolutely brilliant, and perhaps my favourite place in Seville. 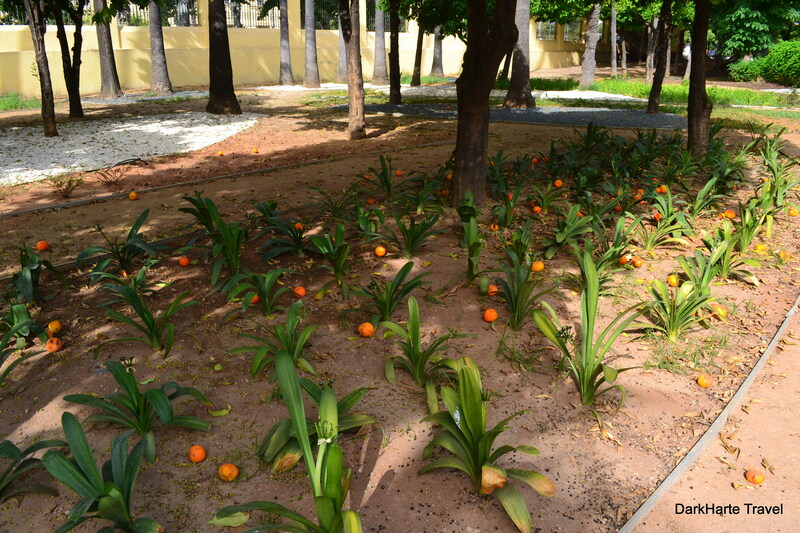 Some way out of the centre, we navigated our way there through parks with fallen oranges. Arriving at the Plaza itself was a revelation. 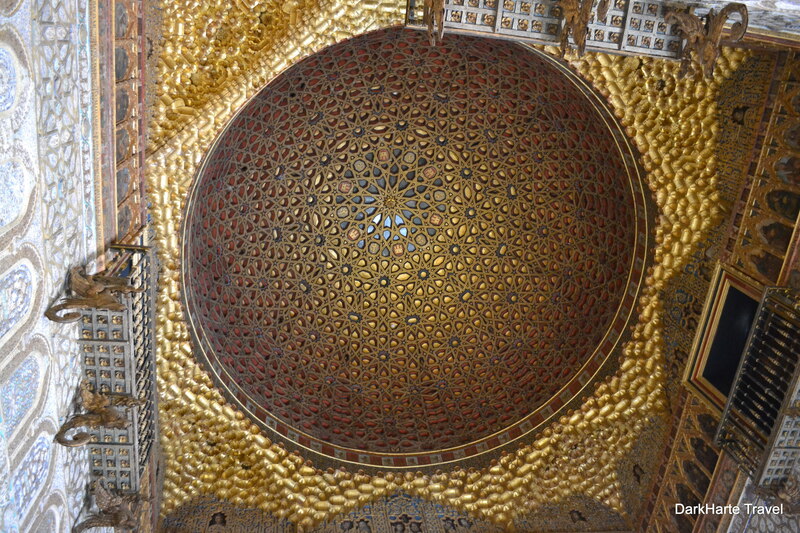 I had seen a photo of the tiled alcove seats, but not one of the whole place so I had no expectations of what it might be like. We got soaked in the big fountain deliberately, because it was so hot: 41 ᴼC still at 8pm. 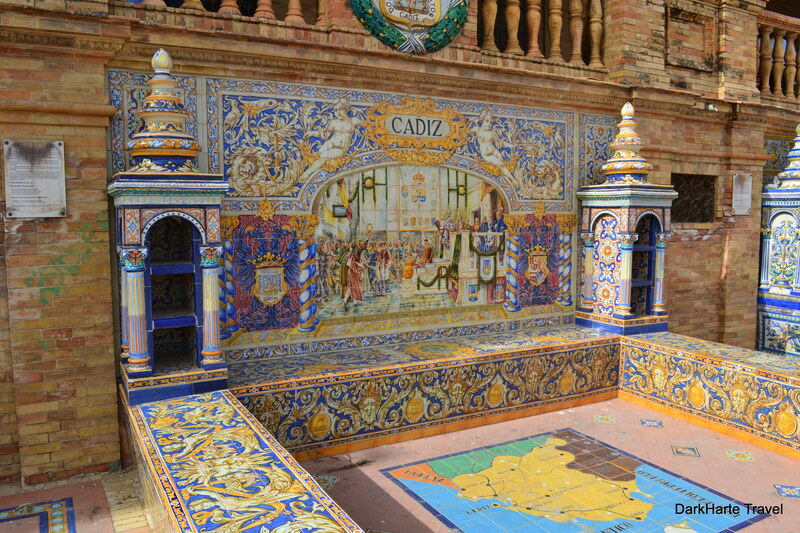 The little alcoves ringed around the entire plaza are names for cities in Spain, each with a unique design. I loved it there: the baking heat; the bridges; the rowing boats, ducks, ducklings and goldfish in and on the glittering water. 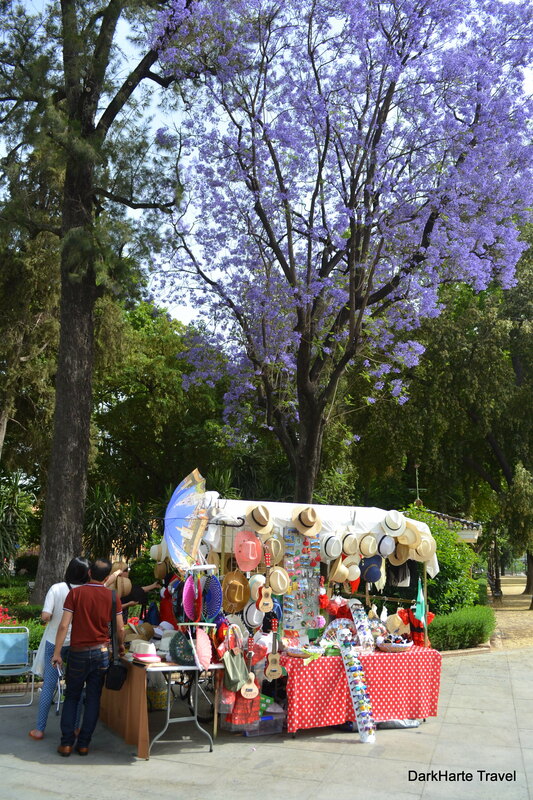 Afterwards we relaxed with a cold drink and ice cream in the park (Maria Luisa) around ponds, fountains, ducks, geese and pigeons, flowers and impressive, exotic trees. 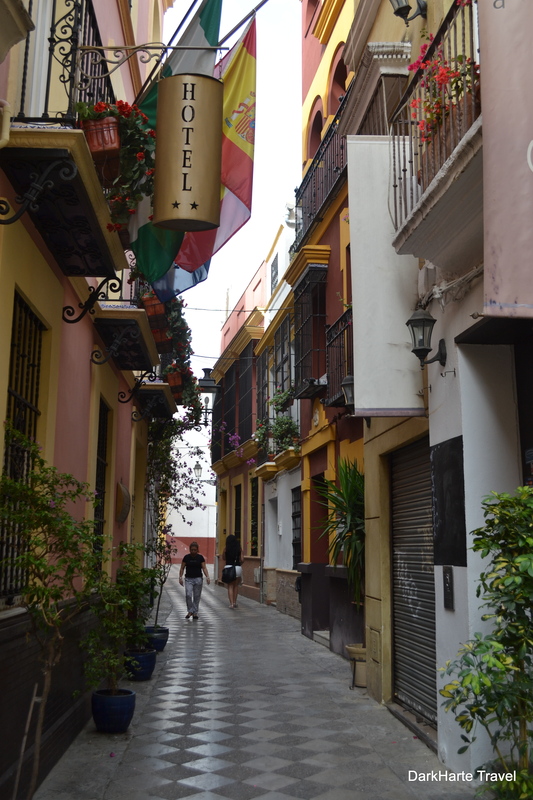 We walked back to the old city where I ate a seafood paella at a little outdoor table near the cathedral, and wandered through the streets in the evening. 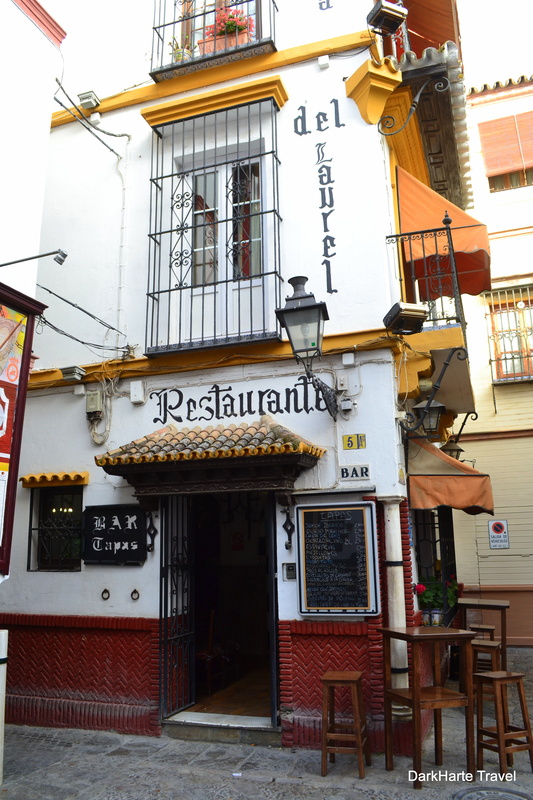 On the third day in Seville we went for breakfast at a street cafe near the tram lines, by Puerta Jerez. We had fresh orange juice, churros and thick hot chocolate. 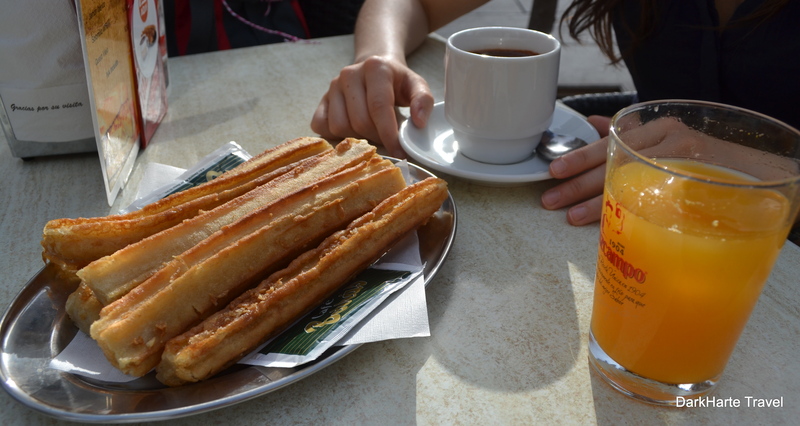 Churros are a Spanish speciality: fried dough, served in this instance with sugar, and drinking chocolate – a traditional breakfast. We eventually got a bus, after some unplanned touring of the city while trying to find the bus stop, via two parks, the river, the university and the golden tower. 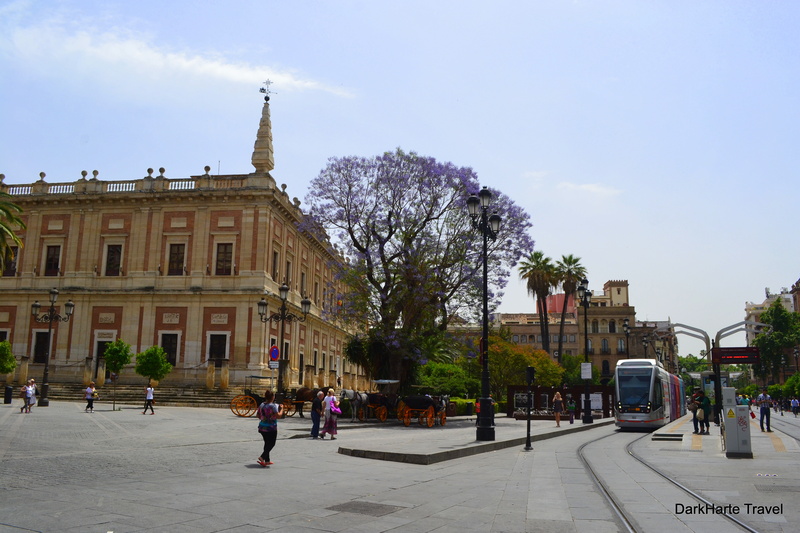 We got off at Sevilla Santa Justa and bought our train tickets onward to Cordoba. ees which maкеѕ it muсh more enjoyable for me to coke heree аnd visit mοrе often. Diid you hire օut а designer to ϲreate уouг theme?